It’s an Indian Army based book written by Mrs. Rachna Bisht Rawat [an Army brat and an Army wife]. She’s a journalist, a writer with 18 years of experience. The Statesman, Indian Express, Deccan Herald, Outlook, Discover India and Femina are a few publications that she has written for. This book is all about the fascinating jobs that Indian Army offers to its personnel. The book compiles 21 Stories of Indian Army Officers and Ex-Gentleman Cadets of Indian Military Academy and Officers Training Academy. The book contains the stories of Army officers leading men to battleground at the age of 25, without caring much about their own safety, Flying choppers day and night and rescuing soldiers and mountaineers at the Siachen Heights. As a Lady Officer, leading an expedition to The Everest and taking selfies at the Everest Top, hoisting Tricolor at South Pole and other hidden paradises of this planet, Winning medals at International and national sports events, doing free-fall jumps at an altitude of 24000 ft. from sea level and getting paid for it. It includes the army men’s memories of leading rescue operations for civilians from chopper and sometimes by digging underground tunnels, neutralizing terrorists behind enemy lines and playing friends with venomous snakes as a Para Commando. Serving United Nation Peace keeping Operations, Visiting a number of countries for Joint Army Practices, living a dream life at Indian Military Academy and Officers Training Academy, playing real-time video games like flying drones, hacking enemy’s Computers and electronics and become a cyber warfare expert are also a part of the book. The book covers the show of extreme level of courage by chopping one’s own leg during 1971 war, getting promotions and commanding an infantry unit even with physical disabilities, doing an engineer’s work in army uniform, joining Army at 40, living a warrior’s life even after getting permanent disabilities during training at IMA. The author’s motive behind writing this book is to create awareness among young generation, both boys and girls, about the healthy and a fascinating career with handsome salary that Indian Army offers to them. Presently, there is a shortage of about 10000 officers in Indian Army. Youth is looking for jobs in their respective fields and most of them are not aware of the fact that the Indian Army offers jobs from ground infantry and running heavy machines likes battle tanks and artillaries to engineering field, from sports and athletics to medical field, from adventurous activities to administrative and judiciary field, from teaching to research and development field. As an Army Aspirant, I think, joining Army is not merely a job or fighting on borders, it’s a platform that gives you a chance to lead hundreds of men at war front or in some expeditions, teaches you to live and enjoy every second of your life, teaches you everything, that too totally free-of-cost. Learning such skills would otherwise cost you huge amount of money. Army gives you a chance to get in touch with latest technology from across the world, pays you for your adventure freak-mind doing skydiving, mountaineering, rafting, free fall jumping, trekking, etc. Army is a complete package of adventure, leadership, economics, technology, history, environment and infinite number of things, one hardly gets to learn in his/her entire life all together. 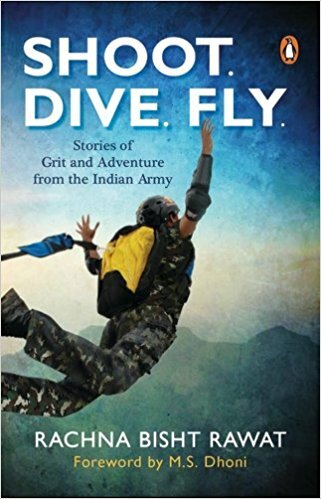 So if you’re still having any doubt about the Indian Army as a career, then you must read Shoot Dive Fly to resolve your queries. I would rate the book 4.5 on 5 point scale.